Do not talk about the conflict in Israel and Palestine! Since 2004 I’ve been working on a photography project about Palestine/Israel. Friends Meeting at Cambridge, my monthly meeting, has been mostly supportive thru grants, clearness committees, individual donations, prayers, and guidance. New England Yearly Meeting also has been helpful, enlisting me as the 2005 session’s keynote speaker, hosting my workshops about Israel-Palestine for the past 3 years, and encouraging me to show my photographs and tell my stories. However, some in my meeting have challenged my direction and perspectives, requesting a meeting to discuss a grant the meeting gave me. Some claimed I was hate-filled and angry, doing more harm than good, and not acting as a traditional Quaker peacemaker. They also asked if I professed to speak for all Quakers. For the 2007 Friends General Conference Gathering (the annual national gathering of North American Quakers) I applied to offer a workshop, “The Question of Palestine and Israel.” After writing me with questions about my proposal, me answering, the workshop committee rejected it. They offered a conversation with the clerk. She told me they had questions about balance, focus and goals. And revealed two salient facts: 1. Mine was in a group of workshops about controversial topics. They’d placed them aside, planning to discern later. They ran out of time, never had full discussion. 2. As far as I could learn reading the brochure of the Gathering, no workshops about the Middle East were held, certainly none about Israel-Palestine, but with a plethora of inward-oriented workshops about topics such as discerning one’s leadings and healing the self; very few were about social justice. I feel the Religious Society of Friends is timid about Israel-Palestine, avoiding conversation whenever possible. Indeed, at this summer’s New England Yearly Meeting sessions, while the siege on Gaza continued, Israel closing the border crossing between Gaza and Egypt, the only exit for most Gazans, stranding upwards of 5000 people in poor facilities in Egypt, over 25 dying, and the continuing war in Iraq raging, I heard no mention of gaza or iraq in our business sessions. And in 2006 during the fiery war between Hezbollah and Israel—and the devastating attacks on Gaza largely overshadowed by the fighting in Lebanon—the only mention at sessions occurred when a group bemoaning the absence of attention held a threshing session. Result? Nothing, no minutes and certainly no action. Friends rightly honor silence, and silence can be powerful, but, quoting Dr. Martin Luther King Jr, “Silence is betrayal.” Our Friends culture of peace too often, in my view, leads to avoidance of conflict, thus, self-silencing, a form of killing the spirit. We might ask, in the case of Israel-Palestine, why is this? Many fear being labeled anti-Semitic, i.e. racist. Or as demonizers of Israel, unfairly singling out this one small struggling nation among many for its alleged human rights abuses. Racism weaves thru the topic, a fascinating and vexing tangle. Is Israel a racist state? Is Zionism inherently racist? What constitutes racist behavior? How do we define racism? Are Israeli Jews racist? Are Palestinians? Do I as a white gentile male in the United States have a right to accuse another nation of racism? For forty years now, racism and megalomania have dictated our lives. Forty years during which more than four million people do not know the meaning of freedom of movement. Forty years in which Palestinian children are born and raised as prisoners in their homes that the Occupation converted into a prison, deprived at the outset of all the rights that human beings are entitled to because they are human. Forty years during which Israeli children are educated in racism of the type that has been unknown in the civilized world for decades. Forty years during which they have learned to hate the neighbours just because they are neighbours, to fear them without knowing them, to see a quarter of the citizens of the State as a demographic danger and an enemy within, and to relate to the residents of the ghettos created by the policy of occupation as a problem that must be solved. “Anti-Semite” will be the other label offered me, despite the fact that Zionism has led to the oppression of Semitic peoples — namely the mostly Semitic Palestinians — and is also rooted in a deep antipathy even for Jews. There is not space in this article to consider all the questions I’ve tried to raise; let’s look at three: racism can be defined as power over another based on so called racial traits—skin color, ethnic origin, name, accent. All operate in the Palestine/Israel conflict. Much of the oppression experienced by Palestinians stems from racism, both within Israel proper (some 20% of Israelis are Palestinian and definitely second class citizens) and especially in the occupied territories (try going thru a checkpoint—three of you, all US citizens, one named Mermelstein, one Schiel, and the other Daoud). Yes, we United States citizens have a right to examine and declare about the situation in Israel-Palestine. The largest recipient of US aid goes to Israel, roughly 1/5 the total US aid amounting to $500 per Israeli per year. Living in a democracy we have not only rights but responsibilities. Thanks to a suggestion made by a Jewish Quaker inspired by a controversy about my Quaker meeting giving me a grant for my photo project about Israel and Palestine, a small group of us have been meeting for nearly one year, the Israel-Palestine Working Group at Friends Meeting at Cambridge. Future unknown but promising. Who but we will speak out? Memorial Museum in Washington D.C. I am touched by the tone but troubled by the direction of your blog. You make mention of the Israel-Palestine Working Group in Cambridge but I see nothing on this page that reflects an Israeli side. As concerned as you seem, it feels as if you see only the usual black-hat vs white-hat perspective. In your case, the Palestinians are the white-hats: simply well-meaning farmers, an indigenous people who would gladly live in peace with their Jewish neighbors if only the Israelis would not be so mean, vicious and racist. 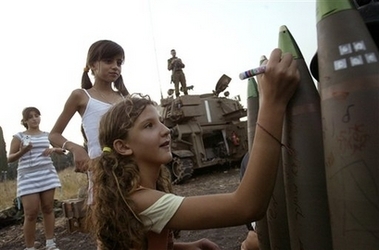 No reference to the repeated attacks on Israel – the buses and pizza parlors, the families in their cars, etc. – by its many Arab neighbors since 1948, no mention of the religious calls for extermination of the Jews, no mention of the daily continuing truckloads of medicine and supplies from Israel to Gaza in spite of Hamas’ repeated calls to never recognize “the Zionist entity”. I do not ask you to reverse your ‘side’ of the Israel Palestine conflict; only to be fair in the presentation that both sides have suffered grievously and have legitimate reason to fear for their very survival if left to the whim of the other. thanks for your comment to my blog. i appreciate your concern that i and my ip group at cambridge friends seem to ignore israeli experiences. 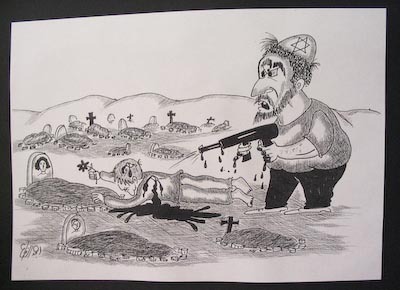 if you look again at my blog i include a racist stereotypic cartoon drawn by a palestinian student at birzeit university. it was part of a larger exhibit hosted by the university and i was horrified by it. the first speaker our ip group hosted was diane balser, executive director of brit zetek v’shalom. and some of us at the meeting have worked closely with jews in our meeting around activities related to the troubles in ip. furthermore, in my own work as a photographer i try to portray the hidden or ignored stories, and regrettably in the case of ip these tend to be the “p” stories, those of palestinians. in some of my shows i reference suicide attacks, hamas perspectives many of which i do not support, rocket firing from gaza and the like but my mission is not be be balanced but to be honest, to fill out the big picture, not recreate all aspects of it in my shows. the big picture, at the moment, is heavily skewed toward mainstream israeli positions and these do not represent the full truth.